Babylon. 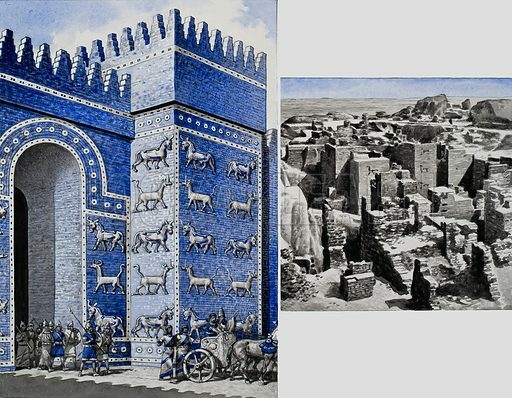 Nebuchadnezzar's royal palace was reached by the Ishtar Gate (left), one of the masterpieces of ancient architecture. It was covered with blue ornamental bricks or tiles and decorated with bulls and dragons. Nothing but sand-blown ruins marks the spot where Babylon once stood in the Iraq desert. Amid them is all that remains of a great palace built by King Nebuchadnezzar 25 centuries ago, to mark his prowess as the greatest conqueror of the day. Original artwork for illustrations on p22 of Look and Learn issue no 727 (20 December 2975). Available worldwide for immediate download up to 4,536 x 3,527 pixels.